Car drivers nowadays are no strangers to car insurance and it will be hard to find a driver that is accident-free because no matter how safe you drive, sometimes the accident finds you! The traditional car insurance evaluation system is based on age, gender, classification of the insured vehicle, the value of the vehicle, etc. Selling and purchasing car insurance can be a lengthy process, the sales pitch, quotes and back and forth coverage details. It is time-consuming for the insurance company and car owners. And more often than not, it is right up until an accident claim has been made where drivers find out the insurance they purchased did not cover the accident they are involved in. This is when insurance companies often find themselves at the receiving end of complaints. According to Allied Market Research, the usage-based insurance (UBI) market is expected to be worth up to $120 billion by the year 2023. TransIOT, an expert in smart cloud platforms and IoT telematics, is offering UBI, also known as the pay as you drive (PAYD) insurance. It is an automated customized insurance system that encourages safe driving behaviors, rewards safe drivers, saves time and cost for all parties involved. TransIOT offers two solution variants, an embedded solution for automotive manufacturer (AUTO OEM) that can be implemented by car manufactures during the vehicle production process and an on-board diagnostics (OBD-II) dongle that can be added to your vehicle, suited for car owners that want to take advantage of the UBI experience. Utilizing the vehicle’s OBD-II, one’s driving behavior, mileage, time, speed, braking, seatbelt usage, etc. can all be retrieved and analyzed to evaluate the safety rating of a particular driver/ car. Data from the OBD-II system is a direct representation of how a car has been driven or a reflection of how “safe” the driver is. This data can be used as the baseline measure for UBI. However, the OBD-II data can be easily accessed and tampered with, rendering the data authenticity in UBI questionable for the insurance company. This is where BiiLabs steps in with their Alfred API, it rectifies data authenticity issues by encryption using distributed ledger technology (DLT) to create a “hash value” on recorded data from vehicles and the data is stored on Tangle. IOTA Tangle is a distributed ledger platform, it is lightweight, scalable, secure and enables money transfers to be made without any fees. The distributed ledger technology (DLT) is a consensus of replicated, shared, and synchronized digital data geographically spread across various sites around the world. It is a decentralized peer-to-peer database making the data impossible to tamper. BiiLabs’ blockchain is based on IOTA Tangle where the distributed database serves as a ledger and is updated cryptographically. This ensures UBI data authenticity and proof of existence (PoE) for each transaction. All data records produce unique digital footprints called ‘hash value’ through DLT. The hash value can further develop into credentials due to its verifiability. However, credentials do not mean the contents, since data is actually stored off-chain. In other words, we only provide reliable evidence to prove the existence of the data. The raw data is available to write into the blockchain directly. Thus, not only its footprints, we make data-tampering extremely hard by decentralization. BiiLabs DLT works coincide with TransIOT to accurately resolve pain points of UBI. The onboard OBD-II device will automatically deliver distributed ledger data without human intervention and the cryptographic data is transparent and difficult to tamper. Most importantly, the mechanism significantly saves the costs of traceability. BiiLabs Alfred API and TransIOT UBI is your one-stop DLT UBI solution. It is applicable to new/ old vehicles that offer our partners the best service efficiency when managing a car fleet with easy deployment and implementation. BiiLabs’ DLT and TransIOT’s UBI is one of a kind in Taiwan. The core technological aspect of the platform covers hardware implementation, mobile 4G and cloud services. Whether you want to implement UBI or Telematics Service Provider (TSP) plans, you are looking at savings running costs up to 50%. TransIOT has technologies that can accurately and efficiently assess driver behavior and risks analysis, mileage and navigation, accident damage analysis, consumables wear estimation, emergency assistance statistics analysis, etc. to ensure the insurance purchased is the perfect match for the driver/ car. 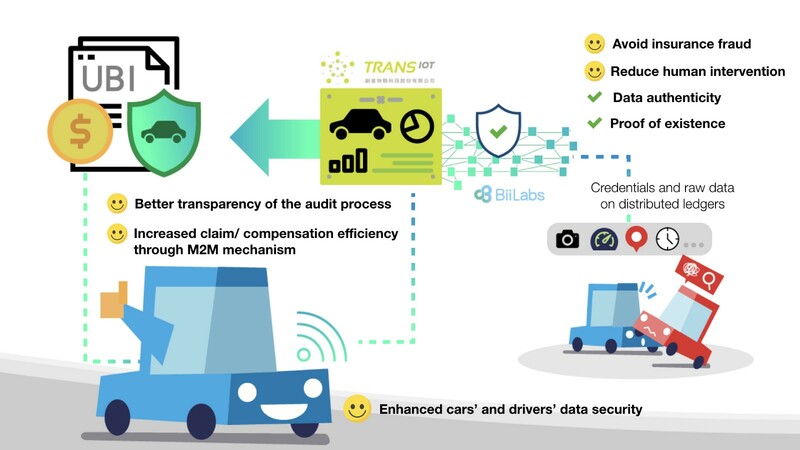 BiiLabs Alfred’s DLT and TransIOT’s UBI offer the most reliable and authentic driver behavior and risk analysis data for UBI contract assessment. BiiLabs DLT’s data authentication with TransIOT smart cloud’s big data offers the most comprehensive UBI experience. Car owners blindly entering insurance contracts without baseline measures and the in-transparency of the car insurance industry are major issues that cost car owners and insurance companies millions of dollars each year. Not to mention the inefficiency of the accident claim process car owners needs to endure. The cooperation of BiiLabs and TransIOT revolutionizes how one purchases their insurance by generating a secure and transparent data as an evaluation baseline for a UBI contract. The application of such technologies will benefit car owners, companies with car fleets, insurance companies and expedite the accident claim process. Tech observer, learner & writer.